User input controls the moon lander’s five thrusters, visualized by simple particle systems. An inertial system determines rotation and translation of the lander. The moon lander was modeled in 3DS MAX. The main remaining problem here is how to divide thrustor forces between rotation and translation, or to be precise, how to determine the ratio between translation and rotation given a force at a certain point having with a known centre of mass. This factor has been estimated to “feel” good. 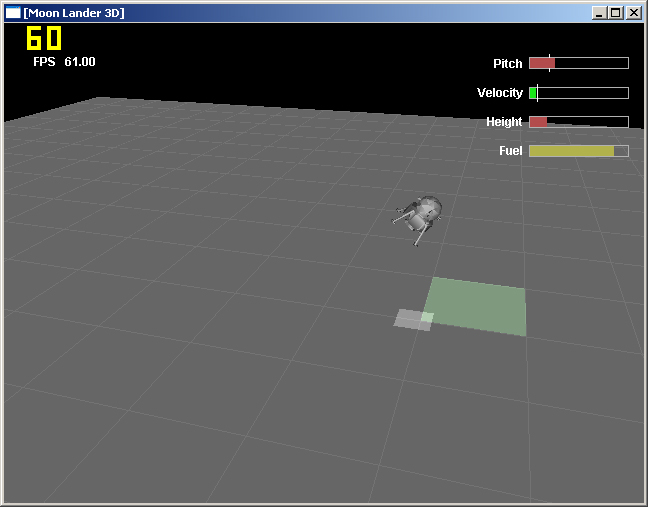 The simulation was turned into a game, where the user tries to land at a given location within fuel constraints, which is more difficult than it might seem.